Hey guys and gals, here is your friendly reminder that Valentine’s Day is right around the corner (you’re welcome, fellas). Do you have your plans all set? Sure, you could go out to a fancy restaurant and drop a lot of dough, but why not really make this year memorable with a 5-star quality dinner you made yourself at home? Not sure where to start for recipes for an intimate and delicious dinner date night at home? Check out some of our favorite Valentine’s Day dinner recipes, perfect for two. This recipe from The Full Helping is a perfect Valentine’s Day or date night meal. This polenta dish is delicious and easy to make, but has the heavenly aroma of a dish that has been slow cooking and simmering all day long. Polenta is a dish of boiled cornmeal that is typically made from other grains, making it a reasonably nutritious dish to boot. This dish is a well-worth visit outside of your usual culinary comfort zone. This recipe from our recipe developer Rachel is a satisfying, rich and delicious chowder you can enjoy without the guilt. Unlike normal chowders, typically full of cream and starchy potatoes, this recipe substitutes the potatoes with white beans, which when blended in a food processor make a pitch-perfect substitute for the thick, creamy base. This cuts out about half of the dairy called for in traditional chowder. The thickness of the broth is complimented by spicy chorizo for balance and shrimp, corn and fresh herbs all of which burst through with flavor. Intimate and rustic, this is a perfect Valentine’s Day recipe, and you’ll likely have leftovers too. Elegance and ease are the themes for this recipe from our food blogger Kate, making this a great date night recipe. This recipe screams sophistication and is bound to impress the eyes and mouths of whoever you cook it for. The dirty secret of this dish though: it couldn’t be simpler to prepare! For all the flash and flair of the final product, it is simple to prepare and has a limited list of ingredients. Blackened seasoning is cajun incarnate and is perfect with salmon. The blackened salmon has smoky and spicy flavors that masterfully paired with the sweetness of the relish for amazing flavor. Great as a side dish or as the main course, this recipe from Minimalist Baker has the striking visual aesthetic, not to mention the rich flavors, you really want from a recipe you want to employ when impressing your company is the goal. This dish has everything going right for it, perfectly balancing sweet, savory, fresh, smoky, creamy, zesty and great for your waistline as the cherry on top. 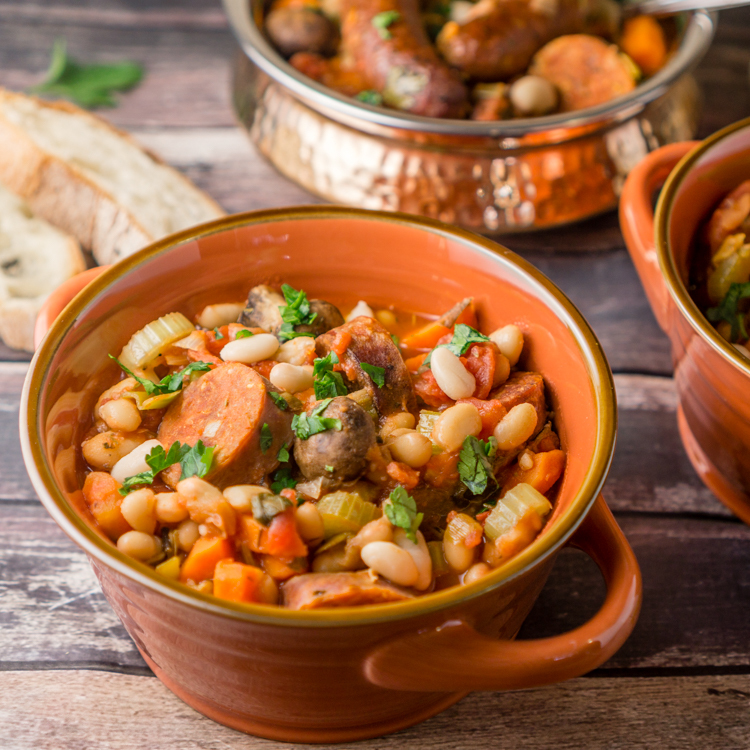 This recipe from our recipe developer Kate is a simple yet robust cassoulet featuring sausage and Randall Great Northern Beans, perfect for a cozy Valentine’s Day dinner at home. What makes this dish fantastic isn’t just its rich flavors, but also the ease with which anyone can make it, from kitchen novice to expert. Needing only some basic sautéing and time in a slow cooker, it’s perfect for anyone to surprise that special someone with a home-cooked meal to celebrate Valentine’s Day. Go ahead, ditch the plans on the town, get cozy at home and make this holiday special with a meal made at home with lots of love. And, be sure to check out more great bean recipes here!